Cummins generator sets are powering the critical command, control and communications systems on Australia’s new Cape Class patrol boats which are described as an important milestone in the country’s maritime border security program. The eight new 58-metre Cape Class vessels – replacing the ageing fleet of 38-metre Bay Class patrol boats – are being built by Austal at its Henderson shipyard (near Perth) in Western Australia. 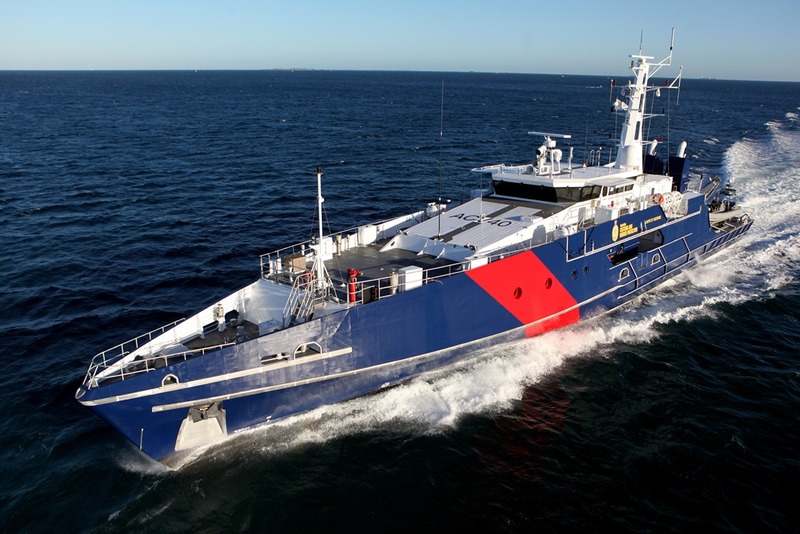 Austal was awarded the $330 million contract in 2011 for the design, construction and in-service support of the Cape Class – a vessel specifically designed for critical maritime law enforcement with the Australian Customs and Border Protection Service. The first of the new patrol boats was delivered earlier this year while the remaining seven are due to be operational by August 2015. They will provide an “enormous boost in capability” according to the Customs and Border Protection Service. New Cape Class patrol boats are equipped with twin Cummins QSM11 gensets which provide the critical power for the sophisticated electronics systems for command, control and communications. Field testing of the biggest generator set ever developed by Cummins will begin at an Australian mine site later this year. 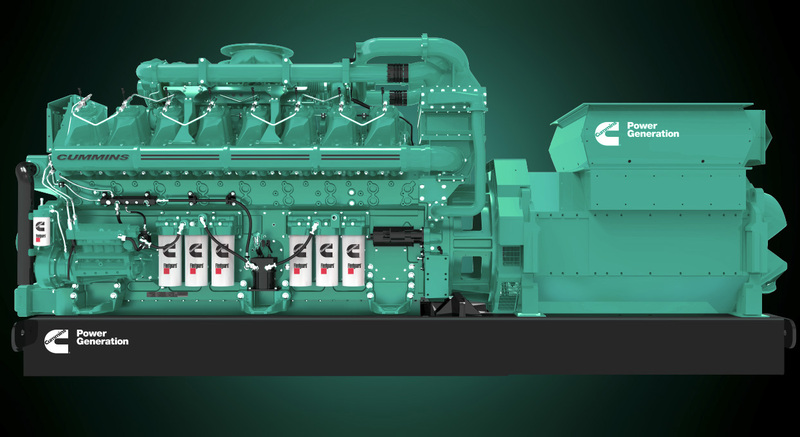 The 3.5 MW C3000-series generator set incorporates Cummins’ new QSK95 engine, a 95-litre V16 that achieves higher output from 16 cylinders than competitors’ 20-cylinder engines. With an output of over 4000 hp, the QSK95 is the highest horsepower engine ever developed by Cummins. The C3000-series marks the start of a new line of diesel and gas generator sets from Cummins. A high-speed diesel (1200 to 1800 rpm), the QSK95 will eventually become available for a range of high-hour, high-load applications including power generation, mine trucks and excavators, oil and gas drilling modules, locomotives and marine vessels. Victoria’s new Centre for AgriBioscience, AgriBio, is one of Australia’s premier bioscience facilities.The $288 million facility, at La Trobe University in Melbourne, is primarily designed to help support and protect Victoria’s $11.8 billion agricultural sector. With up to 400 staff including scientists, students and business support, AgriBio will also have a major impact on the quality of scientific research benefitting not only Victoria but also Australia. One of the features of the new facility is the tri-generation power plant that utilises a Cummins lean-burn gas generator set to reduce carbon emissions and improve energy efficiency. 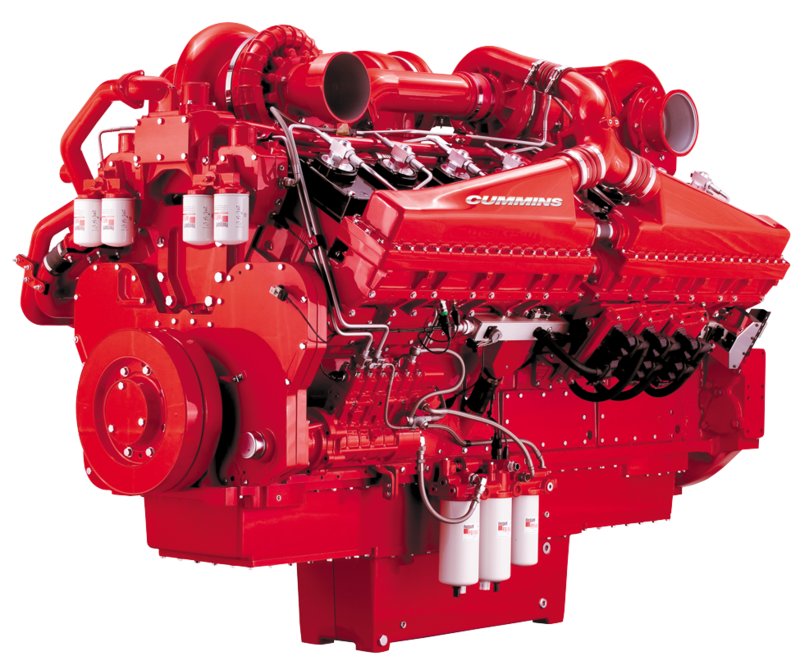 The tri-generation system, which simultaneously produces electricity, heating and cooling, is designed around a1160 kWe genset powered by a gas version of Cummins’ 60-litre QSK60 gas fired engine. This genset is coupled to an absorption chiller which takes heat energy from the gas engine’s exhaust gases and converts it to chilled water which is then used for air conditioning at the facility. The tri-generation gas genset provides baseload power each working day between 7 am and 7 pm. In addition, the standby power system at AgriBio utilises Cummins diesel generator sets – two 1600kW units powered by the QSK60 diesel engine. A key feature of the power system is that the tri-generation gas genset can synchronise with the standby diesel units and load share in the event of a blackout. “Cummins’ ability to fully integrate gas and diesel genset technology as well as provide an integrated system solution in design and construct projects is a key differentiator between Cummins and the competition,” says Nick Rousch, senior power generation application engineer for Cummins in Melbourne. A Cummins DMC300 digital master control system provides the control and monitoring for all the gensets as well as the three utility supplies with three main switchboards. The power generation team at Cummins Laverton (Melbourne) worked closely with KLM Group – the electrical contractor for the AgriBio project – on the design and construction of the power system. In particular, the tri-generation aspect required careful design and selection of equipment and systems interlocks to provide the gas supply, ventilation, exhaust system and utility connection arrangement to meet the compliance requirements of Energy Safe Victoria and network provider Jemena. Commissioning required integration of all building services to test the functioning of the power system under tri-generator operation and under all utility power fail scenarios. AgriBio is a joint initiative between the Victorian Government, through the Department of Primary Industries (DPI), and La Trobe University (La Trobe). Grocon was responsible for the design, construction and commissioning of the project. AMP’s upgraded $5.6 million standby power system incorporates three Cummins 1400 kVA generator sets. 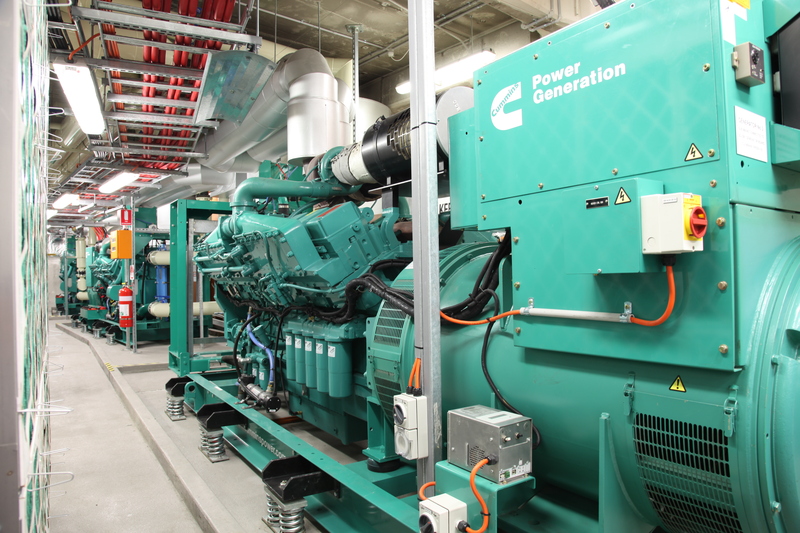 Three Cummins generator sets are at the heart of a $5.6 million upgraded standby power system at AMP’s Australian head office at Circular Quay in Sydney. The new gensets replace two Blackstone generators that were installed in the Alfred Street building in the late 1950s. With 27 floors and a 106-metre height, the curved AMP building was Sydney’s first high-rise when it was opened in 1962 and held the title as Australia’s tallest skyscraper until 1965. It was heritage listed in 1996. Since wealth manager and life insurer AMP operates a number of business critical services from the building, including a data centre, it is essential that a reliable standby power system is available.